In fact, there’s a Demon-chaser from Mopar which reveals a 1,000-horsepower crate motor that takes last year’s version of the Hellcat line to new levels. 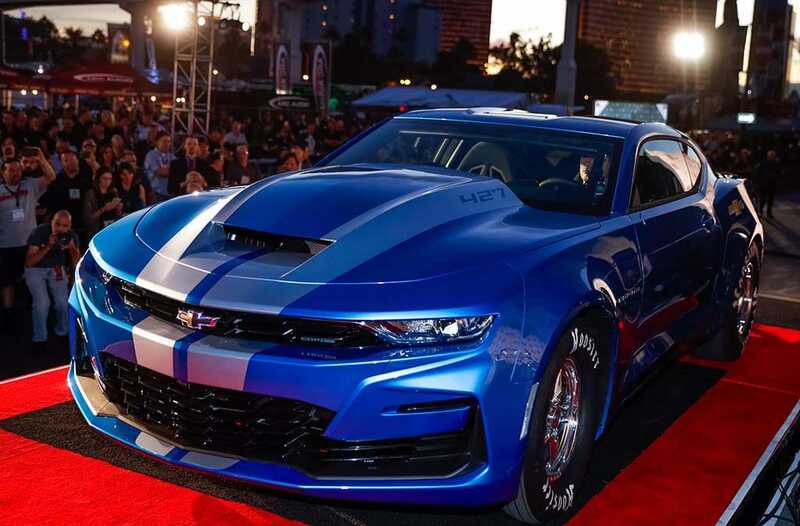 As you’d expect from SEMA, there’s plenty of attention paid to performance, with Chevrolet and Nissan among those burning rubber with pumped-up versions of their stock offerings. 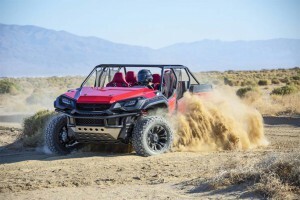 There are plenty of big names on hand, as well, with racer Graham Rahal offering his take on the Acura A-Spec, while Oscar-winning actor Kevin Costner offers up his personal vision for the Toyota Tundra. And for those looking off to the future, you won’t want to miss Chevrolet’s spin on its classic drag racer, the eCOPO concept promising to electrify the quarter mile circuit. Of course, there are also some pretty off-the-wall concepts, as well, including a pizza-making pickup, and a compact take on an SUV that might really stand for Speaker-Utility Vehicle. 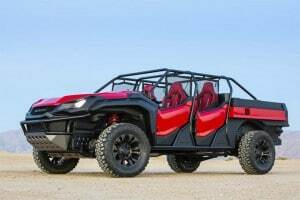 And Honda rolls out to the desert with its modern take on a dune buggy. The new Acura RDX has been generating plenty of buzz, but Graham Rahal is amping things up with his own take on the compact SUV. The IndyCar driver set out to enhance the ute’s performanceand has made a number of changes to everything from its powertrain to its wheels and tires. Mopar's Hellephant engine puts out 1,000 horsepower. 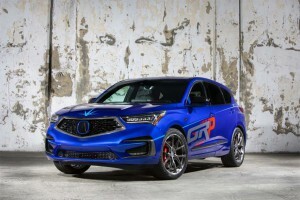 The upgrades include a new turbocharger, intake and exhaust manifolds for the stock 2.0-liter VTEC engine, as well as a custom cat-back exhaust, the package now pumped up to 345 horsepower and 370 pound-feet of torque. Chassis mods include custom Eibach springs that lower the RDX by two inches, along with six-piston StopTech brakes, 21-inch lightweight alloy wheels and new Michelin Pilot Sport 4S tires. What started out as a 1969 Dodge Charger gets a near-complete makeover, the folks at the Mopar parts division tweaking everything from the drip rails and pop-up headlights to the powertrain. For one thing, For one thing, the oddly inset wheels of the original muscle car have been moved out, the overall coupe gaining 4 inches in width. The wheelbase, meanwhile, has been stretched from 117 to 119 inches. The biggest change? The swap-out of the original V-8 for the 426 Crate Mopar Hellephant. If you thought last year’s Dodge Demon pushed the limits, think again. With a still-larger supercharger, the package can muster up 1,000 horsepower and 950 pound-feet of torque, with a redline of 7,000 RPMs, and Mopar chief Steve Beahm contends it is durable enough to run repeatedly down the dragstrip. 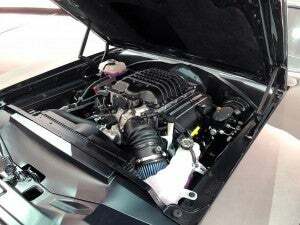 The new package will be offered in engine-only form for $19,000, though buyers will also be able to get a Demon-like “Hell Crate” that includes the electronics and everything else needed to package the engine, for $21,995. Chris Forsberg, a three-time Formula Drift champion is working the SEMA Show with his own take on the Nissan 370Z, here tuned specifically for the racing circuit. “This car is the essence of show-and-go,” suggests Nissan, with a heavily modified version of the Japanese marque’s twin-turbo VQ under it carbon fiber hood. Anybody who thinks battery-electric vehicles are sluggish and boring could be in for a real shock after getting a look at the Chevrolet eCOPO. Its debut marks the 50th anniversary of the debut of the original Chevy COPO Camaro and hints at what we could see running the dragstrip as battery cars start to work their way into the mainstream. The 800-volt system uses a pair of electric motors, each punching out 300 lb-ft of tire-spinning torque to the same solid rear axle used by the conventional, limited-edition Chevy COPO Camaro. Chevy estimates the package could push the eCOPO through the traps in a mere 9 seconds. Kia has long been a big player at SEMA and its list of concepts and production models could be the biggest at the show of any automaker. 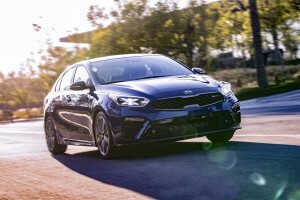 This particular world debut sees Kia add a little more athletic prowess to the Forte, which will be offered in both GT1 and GT2 packages when it goes on sales next summer – basically as Kia’s response to sibling Korean carmaker Hyundai’s N line. The GT pair will get a new turbocharged four that pumps power up to 201 hp. Buyers will have the option of a six-speed manual or a seven-speed dual-clutch gearbox. Also on tap, fully independent front and rear suspensions, and a new, sport-tuned exhaust. There’ll be a range of options, including LED headlamps, and 18-inch Michelin Sport performance tires. Exterior tweaks include gloss black outside mirrors, sport side sills and a rear spoiler. Inside, look for alloy sport pedals, a leather-wrapped flat-bottom steering wheel and options “Sofino” sport seats. 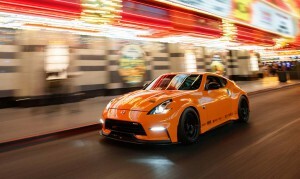 For those who want a different type of performance, Nissan rolls into Las Vegas with the Kicks Sound Machine. Created by Hollywood’s Vehicle Effects, it is a rolling speaker. Or set of speakers, include eight Bose Virtually Invisible 791, as well as three Bose F1 1,000-watt powered subwoofers. Not enough? Add two Bose RoomMatch Utility RMU206 speakers. Most of those are hidden away until the pneumatically operated roof opens up. 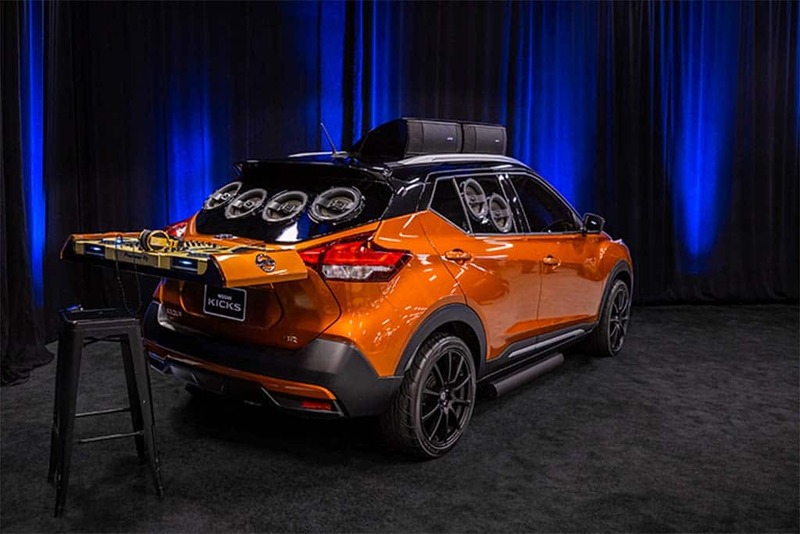 To feed tunes, there’s a professional DJ system, mounted in two articulating rear drawers that pull out of the back of the Kicks, including mixers, multi-players and more. Toyota is another brand ready to party, and this heavily modified version of the big Tundra pickup can feed a hungry crowd, using two robotic arms that can “bake, cut, box and deliver the pizza,” the automaker explains. 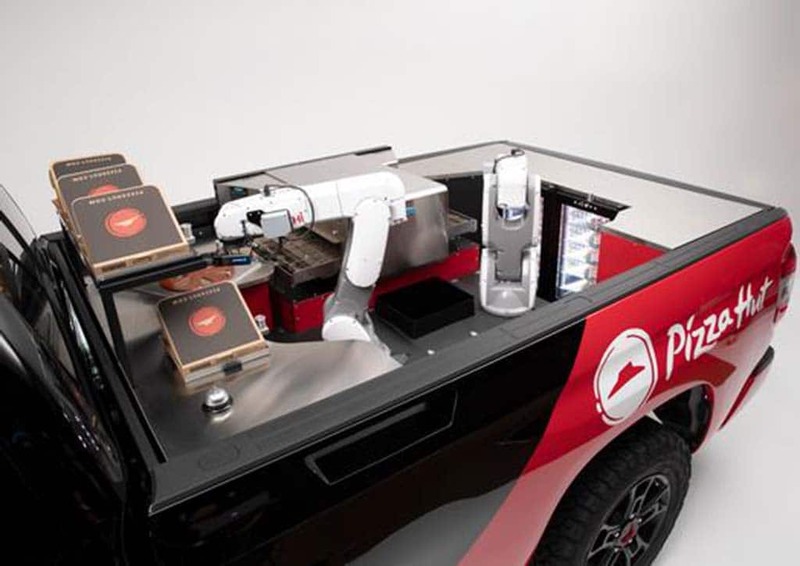 But in keeping with its environmentally friendly focus, Toyota has cleaned things up by using a fuel-cell drivetrain to power the truck, as well as its pizza oven. The hydrogen stack is derived from the Toyota Mirai and sends power to motors on the front axle. Toyota also delivers some star power to SEMA this year with the customized Tundra Platinum pickup built by film star Kevin Costner. “The Tundra has been outfitted with an array of custom equipment to tailor its use to Costner’s passion for nature and active outdoor lifestyle,” Toyota notes. 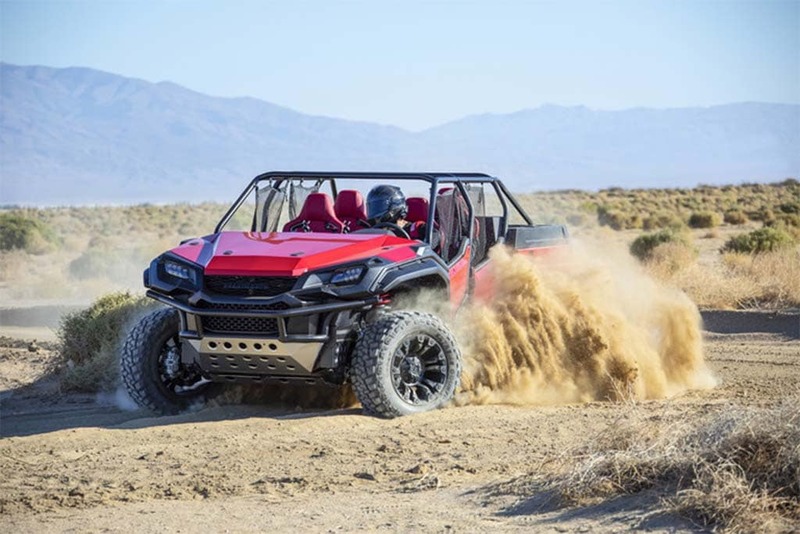 Apparently, the desert must be calling, so let’s wrap up our SEMA preview with a look at Honda’s modern take on a dune buggy – here combining bits and pieces of its Pioneer 10000 utility vehicle and a Ridgeline pickup. Calling it “the ultimate open-air Honda adventure vehicle,” we can imagine there are plenty of folks who’d like to take this out on the trail. The Open Air concept was designed by Honda’s California design studio, with input from its U.S. engineering center, as well, and combines a “modified Ridgeline body and suspension, along with production Pioneer doors and custom designed bed and tailgate panels modeled after the Pioneer.” The rest of the vehicle also comes from the Honda parts bin, including seating from the Civic Type-R. This entry was posted on Wednesday, October 31st, 2018 at and is filed under Acura, Auto Shows, Automakers, Automobiles, Cadillac, Celebrities, Chevrolet, Concept Cars, Crossovers/CUVs, Designers, Dodge, Events, Executives, FCA, Ford, GM, Honda, Kia, Markets, Muscle Cars, Nissan, Personalities, Pickups, Racers, Ram, SEMA, SUVs, Sales, Sedans, Toyota, U.S./North America, Volkswagen. You can follow any responses to this entry through the RSS 2.0 feed. Both comments and pings are currently closed.